Shotgun events open to as few as 36 Guests-a.m., 56 Guests-p.m.
Varies depending on day of the week and time of the year. Please contact Patick Gogoel, Associate Golf Professional, for more information regarding pricing. ~Your group may start any time of the day via a Course Buy-Out option. Please inquire with Club for details. All shotguns may be reserved up to 1 year in advance. A signed agreement and 25% deposit are required to secure the date. A final billing headcount is due 3 days prior to the event date. The number given on that day will be the number you are billed for. Westfields Golf Club reserves the right to have other players on the golf course if a shotgun group has less than 120 players. Final payment of all expenses is due on or before the day of your event. According to the terms outlined in the agreement, deposits must be made on time to avoid cancellation. We are happy to provide an invoice of estimated expenses and refund any overpayment for your event. 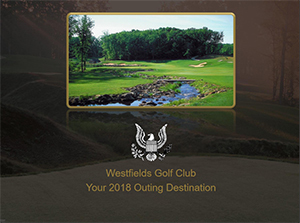 Westfields Golf Club offers one of the Mid-Atlantic's finest golf shops that can provide your guests with tournament tee prizes and awards. We are happy to special order custom logo merchandise for your event as well. The staff at Westfields Golf Club is ready to assist you in making your event or outing a memorable and successful experience. Please call us at (703) 631-3300. Westfields Golf Club offers a full service kitchen with its own Executive Chef to create the most memorable meal. An enjoyable breakfast or luncheon buffet can be customized prior to the round, followed by a casual or elegant dinner to meet your culinary desires for the Awards Reception. Beverages for your guests on course can be served via the Beverage Cart Service in any form of distribution you choose: Billed Based on Consumption, Cash to the Individual, Beverage Cart Package or via Drink Tickets. All arrangements will be customized to meet your needs. Westfields Golf Club teaching staff will develop, organize and conduct a golf instruction event that will be completely customized to meet your needs. Both private & group instructions are available from our PGA Instructional staff on an appointment basis. We are able to coordinate photographers with digital photos that feature a custom banner with your company logo and event date. All photos are developed on-site and are offered in a black jacket for your guests to take home at the end of the day. Westfields is able to order Corporate Gifts such as sterling key rings or crystal golf ball paperweights. Unique frames and statues also make great gifts. Westfields has an inventory of 30 rental sets featuring TaylorMade Jet Speed Irons & Woods. Our staff will personally load the clubs onto the guest's cart before they arrive. Please call in advance to reserve a specific set of rental clubs. Westfields Golf Club is able to coordinate any sign or banner needs that you may have. The signs will be delivered directly to the course. You may identify the positioning and Westfields will place the signs to your specifications before you arrive for your event. Arrange with the course for unique Tournament Prizes such as Certificates for Marriott Hotel Stays featuring Golf Packages, an Autographed Fred Couples Westfields Golf Flag, or customized logo apparel and equipment. Make use of Westfields' state of the art tournament software and A/V equipment to add the extra touch to your event. Custom logoed scorecards and cart cards as well as our 58" large screen TV displays will help you promote your event, your organization, and your sponsors.